Beastie is a participatory performance for 6-10-year olds, by Lone Twin, Whelan’s and Gary Winters’ collaborative performance company (the duo are credited equally for all work). Beastie was commissioned by the Barbican, London, Steirischer Herbst, Graz, Corn Exchange, Newbury and was supported by The National Lottery through Arts Council England. The performance premiered in the UK at the Barbican before moving onto a European premier at Steirischer Herbst. Initial research in 2002, undertaken as Whelan and Winters worked on a project for television with Ragdoll Ltd (Teletubbies, In The Night Garden), revealed children’s outdoor play and exploration to be problematised, understandably, by densely populated urban space. 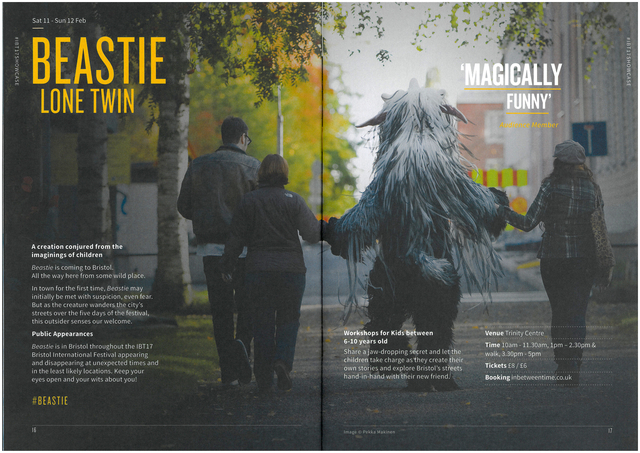 In 2010 Lone Twin returned to this issue with a series of workshops with children in Stratford’s Discover Story Centre, exploring ideas of urban beasts – fictional versions of rural beasts mysteriously roaming the country’s wilder corners. The production, informed by material generated by sessions at Discover, begins in a theatre before spilling out into the real world as the creature, constructed and narrated into life by the young audience, is shown their world on a tour guided by the children themselves: ‘(the children) are not performing for their families; rather, they got lost in the action’ (The Irish Times, 06/10/13). The ‘beast’, a £40,000 costume worn by a performer, creates a confounding moment for adults who accidently happen upon the group, an event that is visibly empowering for the young participants. Beastie continues to tour internationally and has been programmed twice at the South Bank Centre’s Imagine festival (2011, 2012). It is the subject of a study on innovative children’s theatre by Susanne Schittler (Universität Koblenz-Landau) and gave rise to two further Lone Twin children’s projects, Cabaret Simon (The Barbican, 2010) and The Lost Neighbour (2013, The South Bank Centre). Recently versions of Beastie have been shown at The Corn Exchange, Newbury; Chats Palace; Boom Festival, ANTI Contemporary Art Festival, Finland, Liverpool's Unity Theatre, Spill Festival of Performance, Ipswich and In Between Time Festival, Bristol. Commissioned by the Barbican, BITE 10, London; Steirischer Herbst, Graz; Corn Exchange, Newbury and supported by The National Lottery through Arts Council England; with additional support from Chichester Festival Theatre, Battersea Arts Centre, London and Leeds University.